A diamond band is a stunning way to highlight your center stone, adding gentle sparkle to a contemporary, sophisticated engagement ring. We know your love is is one of a kind and we believe your ring should be too. Begin your custom dream ring today. Not sure what your beloved desires? We've got you covered. 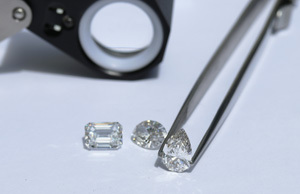 Ada Diamonds will gladly set one of our lab diamonds in a temporary proposal setting so that your proposal can remain a surprise, then you can re-design your ring together as a team and apply the full cost of the original setting towards your new setting. For the bold, the beautiful, the daring among us, choose an engagement ring made with fancy colored diamonds across a rainbow of pink, yellow, blue, gray, red, and black diamonds.